No thanks, that smells terrible. 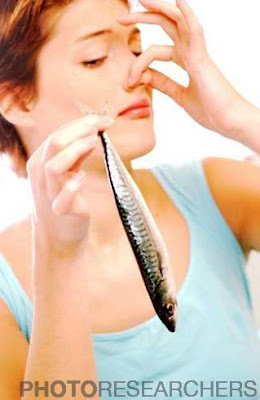 In the news: "Smelly foods make you eat less" By Jennifer Welsh msnbc.com March 23, 2012 BB1588 Woman holding fish. Credit: Véronique Burger / Photo Researchers, Inc.
Feel it in your Gut? See a Doctor. Clostridium difficile bacteria, colored transmission electron micrograph (TEM). 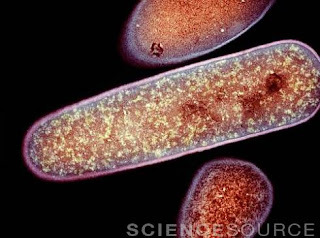 These Gram-positive rod-shaped bacteria can cause pseudomembranous colitis (infection of the colon), one of the most common hospital-acquired infections, and antibiotic-associated diarrhea. These disorders are often due to the use of antibiotics, which kill off normal gut flora and can lead to an overgrowth of C. difficile. Infection can be fatal. Magnification: x32,000 when printed at 10 centimeters tall. Credit: Dr. Kari Lounatmaa /Photo Researchers, Inc. In the news: "Nanopollutants Change Blood Vessel Reactivity" By Janet Raloff ScienceNews March 19, 2012 BT0478 Titanium dioxide. 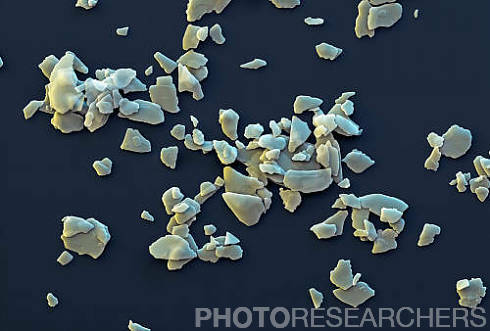 Color-enhanced scanning electron microscope (SEM) of titanium dioxide, which occurs naturally in nature as the minerals rutile, anatase and brookite, but can also be produced synthetically. It has a high refractive index and is used as a white pigment called titanium white and as a food coloring (E171). It is also used extensively in plastics and sunscreen, where it acts as a strong absorber of ultraviolet (UV) light. Magnification: x667 when printed 10 centimeters wide. 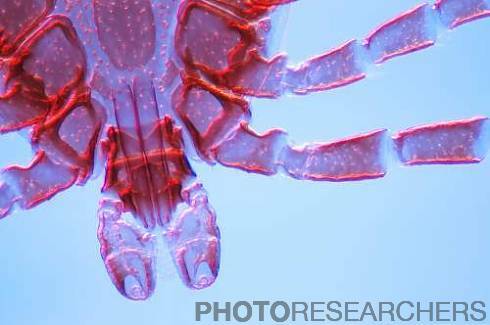 Credit: Eye of Science / Photo Researchers, Inc.
Ticks (Dermacentor spp.) and Lyme Disease - Doggie Danger! BD4207 Eastern Wood Tick (Dermacentor spp.). Credit: Paul Whitten / Photo Researchers, Inc.
SN0361 Diabetic retinopathy. 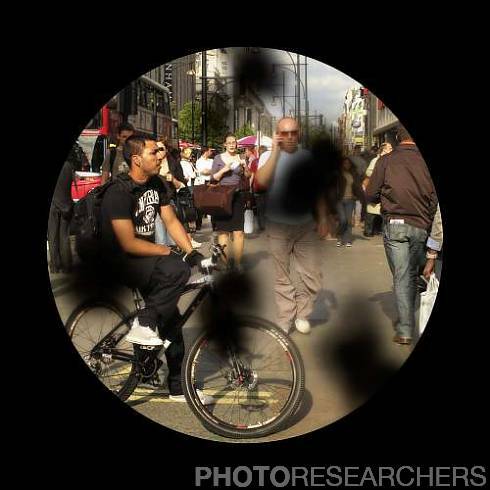 Patient's-eye view of a busy city street, in a patient with diabetic retinopathy. This eye disorder is a side-effect of diabetes, where the build-up of blood sugar damages the blood vessels in the retina. The damage leads to areas of the retina ceasing to function (black patches) and can eventually lead to total blindness. Credit: Cordelia Molloy / Photo Researchers, Inc.
Statins Making you Feel Stagnant? In the news: "Do Statins Make It Tough to Exercise?" by Gretchen Reynolds March 14, 2012 New York Times BF7748 Red yeast rice results from fermenting regular rice with a fungus Monascus purpureus. The fungus partially digests the rice starch granules and produces naturally occurring statins, i.e., substances known to inhibit the production of cholesterol in humans.The statins crystallize on the rice grain surface. Thus, with red yeast rice, the Chinese have been ingesting statins for over a thousand years. The fungus produces Monacolin K, also known as mevinolin, which is the same active statin as the drug Lovostatin. 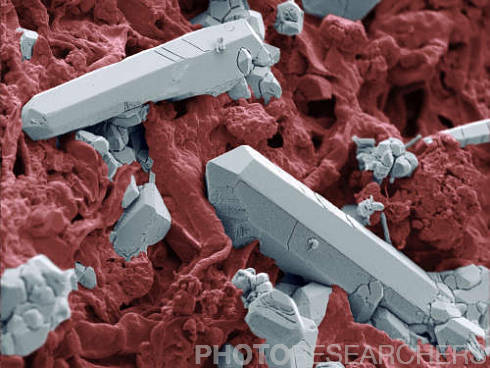 Enhanced SEM. 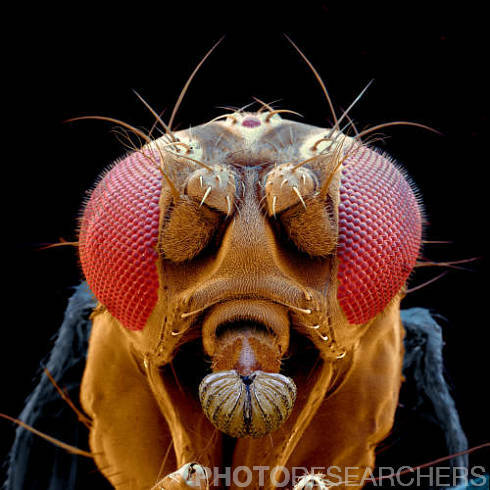 Image width: 80 micrometers, magnification: 1250x if the image is printed 10 cm wide. Credit: Scimat / Photo Researchers, Inc. Global meat eating, conceptual artwork. 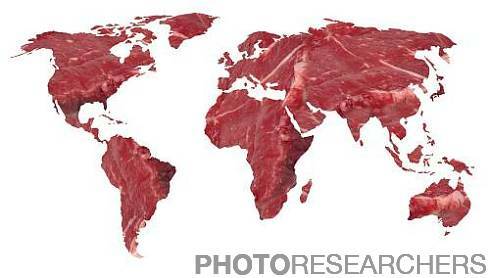 This global map with the outline of the Earth's countries filled in with a close-up of raw beef, represents the global consumption of meat and the impact this has on the environment. The production of meat consumes more resources (energy, water and land) than the production of equivalent levels of plant-based foods. In particular, tropical forests are cleared to provide grazing for cattle. Red meat also contains high levels of saturated fat, a risk factor for heart disease, cancer and high blood pressure. Credit: Victor de Schwanberg / Photo Researchers, Inc.
Look Great In Your Favorite Genes! 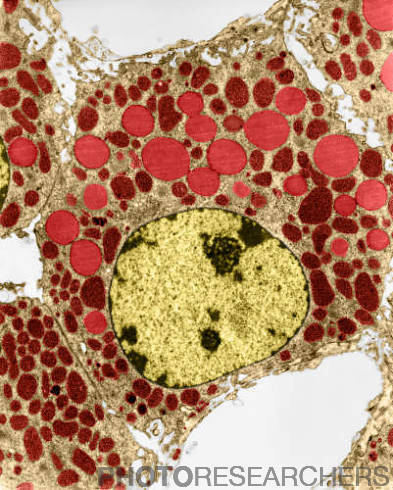 Light micrograph showing blood supply to muscle fibers. 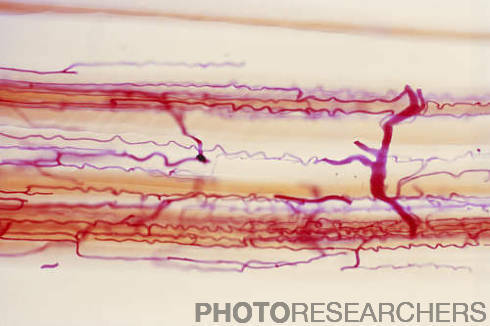 The muscle fibers (pale pink) have been teased apart to reveal the capillary bed (red) that has been perfused with dye. Each muscle fiber has its own extensively branched fine capillary network surrounding it. Capillaries are the smallest blood vessels in the body. They have thin walls that allow dissolved nutrients and oxygen to pass into the surrounding muscle cells. Skeletal muscles are under voluntary control and move the bones of the skeleton. Credit: Biophoto Associates / Photo Researchers, Inc.
BN0852 Transmission electron micrograph (TEM) of a steroid-secreting adrenal cell. Magnification x9,000. Credit: Biophoto Associates / Photo Researchers, Inc.
SL9520 Clostridium difficile bacteria, colored transmission electron micrograph (TEM). 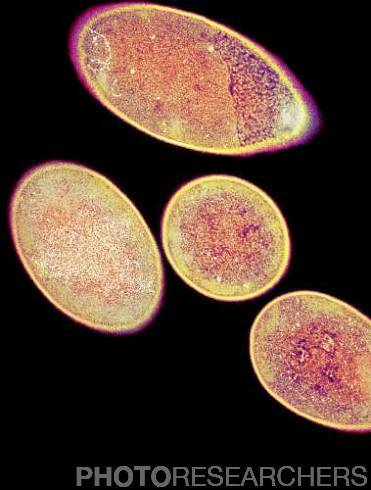 These Gram-positive rod-shaped bacteria can cause pseudomembranous colitis (infection of the colon), one of the most common hospital-acquired infections, and antibiotic-associated diarrhea. These disorders are often due to the use of antibiotics, which kill off normal gut flora and can lead to an overgrowth of C. difficile. Infection can be fatal. Magnification: x35,500 when printed at 10 centimeters wide. 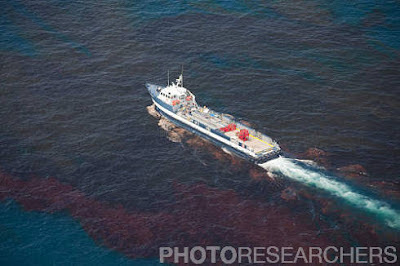 Credit: Dr. Kari Lounatmaa / Photo Researchers, Inc.
Deepwater Oil Drilling? What could possibly go wrong? "Deepwater Oil Drilling Returns to Gulf as Blast Fades"
A ship cuts through heavy dark oil on the surface of the water at the BP Oil Spill disaster. Gulf of Mexico, June 2010. Credit: Jim Edds / Photo Researchers, Inc.
BS0773 An oil rig collects oil from the temporary cap on the blown-out Deep Water Horizon site. Some of the oil is transported to the ship in the background. Gulf of Mexico, June 2010. Credit: Jim Edds / Photo Researchers, Inc. In the news: "How marijuana makes you forget" by Mo Costandi nature.com March 1, 2012 3X7200 - Astrocytes in gray matter of cerebral cortex. Credit: Biophoto Associates / Photo Researchers, Inc. In the news: "For Space Mess, Scientists Seek Celestial Broom" by Kenneth Chang New York Times February 18, 2012 BM3172 Debris in space. 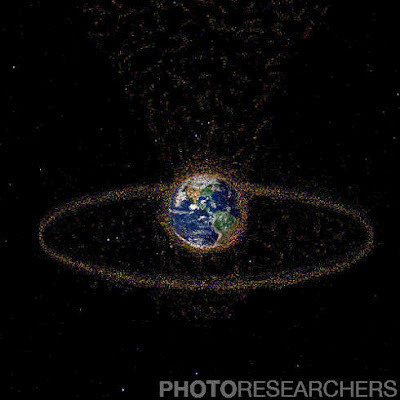 Space debris is the name given to objects orbiting Earth that have been discarded by humans. Such waste can include anything from defunct satellites to small paint flakes. Some of the debris can be dangerous if it collides with spacecraft or with astronauts on space-walks. Credit: Monica Schroeder / Photo Researchers, Inc.